Edvard Munch (1863–1944), The Kiss (Kiss by the Window) (1892), oil on canvas, 73 x 92 cm, Nasjonalgalleriet, Oslo. Wikimedia Commons. Mention the name of Edvard Munch (1863–1944) and everyone thinks immediately of his most famous work – indeed, one of the most famous images in Europe and North America – The Scream. There was far more to Munch and his work than that, and my focus in this new series is on what he considered to be his most important artistic achievement: a series of paintings which he called The Frieze of Life, which includes The Scream. Before looking in detail at the individual paintings which make up Munch’s Frieze of Life, I will give a brief account of his life and career, illustrated by some of his most important paintings. For without understanding his background and seeing some of the rest of his art, his Frieze is profoundly cryptic. 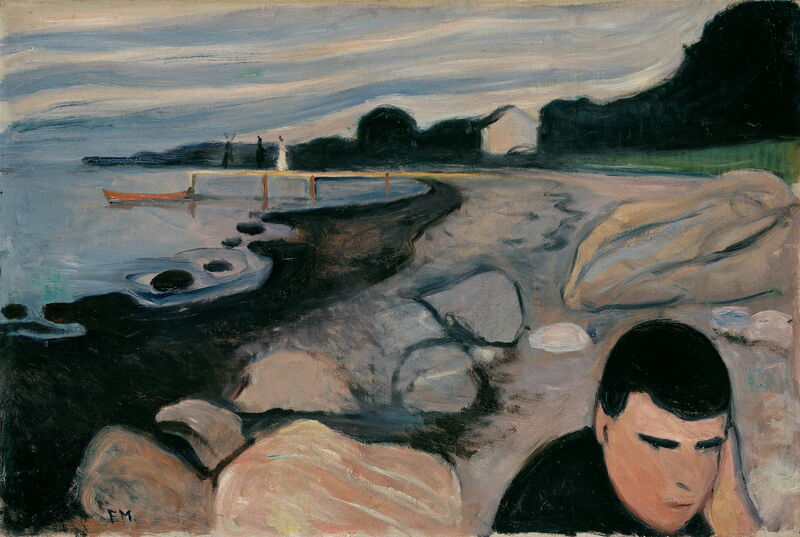 Edvard Munch was born in a very small village not far from Oslo, which was then named Christiania, in 1863. His father was a rural medical practitioner, and his mother much younger than her husband. Edvard had four siblings, including an older sister. The family moved to Oslo the following year, but in 1868 his mother died of tuberculosis, which also killed his older sister in 1877, when Edvard was only 13. The family was then raised by their aunt Karen and father Christian. Edvard was often too ill to attend school during the winter, and his aunt and father did their best to tutor him when he was sick at home. Christian Munch was the son of a priest, and was very religious, to the point of being oppressive at times. Although being a doctor could have brought the family a very healthy income, Christian was poorly paid in military service, and never managed to develop a private practice to augment his income. The family only just scraped along on his meagre salary. Edvard Munch drew avidly through his childhood, and when he was 13, he started painting, copying landscapes at first, but soon moving to oils. He studied engineering at a technical college for a year; although he excelled, he left determined to be a painter, which was strongly opposed by his father. In 1881, at the age of 17, he started his studies at the Royal School of Art and Design in Oslo, where he was taught by Christian Krohg, one of Norway’s major artists who had studied under the Norwegian landscape painter Hans Gude in Germany, and in Paris. Munch adopted a bohemian lifestyle, and in the autumn of 1882 started sharing a studio with some friends and Christian Krohg, who became their tutor and mentor. Edvard Munch (1863–1944), Morning (1884), oil on canvas, 96.5 × 103.5 cm, Bergen kunstmuseum, Bergen, Norway. Wikimedia Commons. 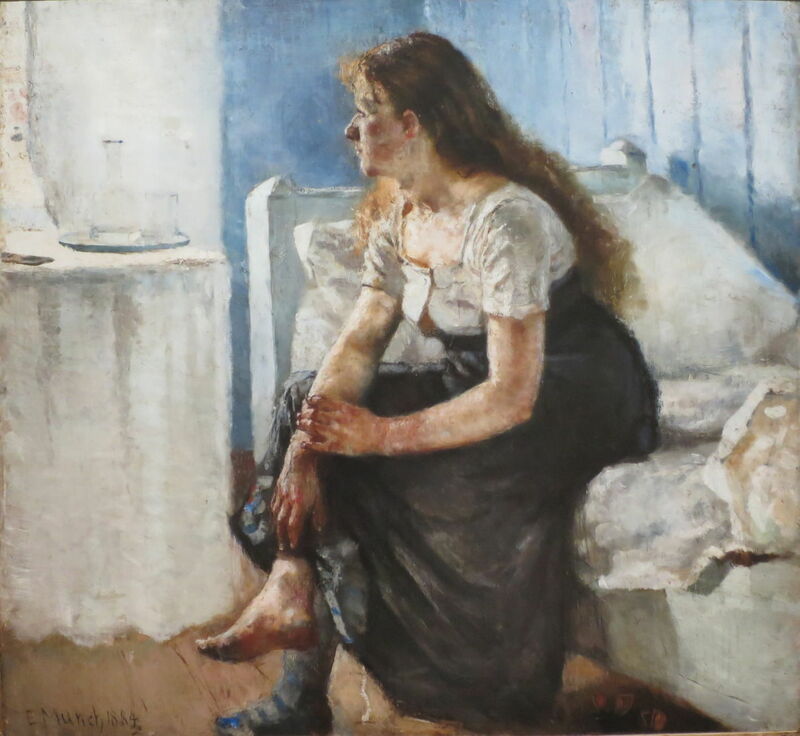 Morning (1884), which Munch originally named A Servant Girl, is generally accepted as being his first important work. 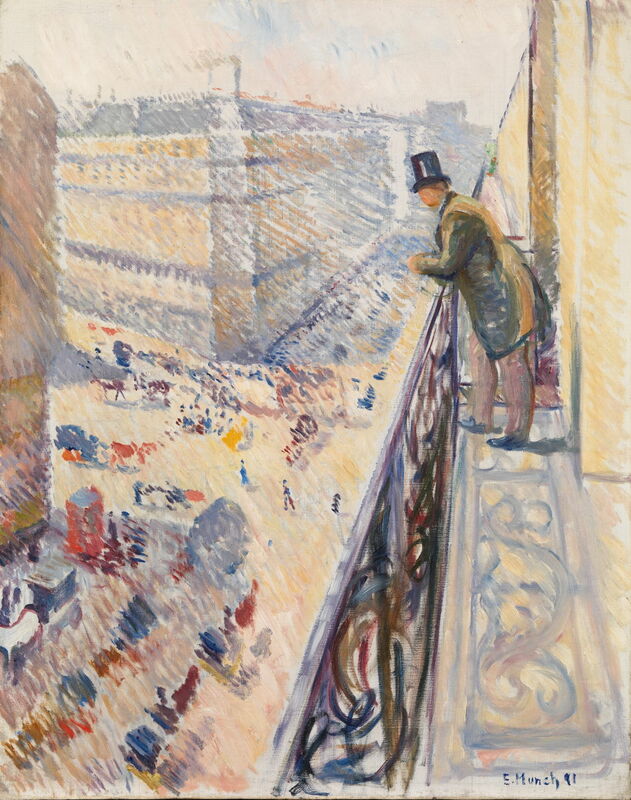 Inevitably influenced by Krohg, it shows an innovative use of light which may have been inspired by Impressionism, which was a hot topic in artistic circles at the time. Although Munch’s painting was recognised early, and one of his paintings included in the World Exhibition in 1885, when that work was exhibited in Oslo it was damned by the Norwegian critics, and Munch became branded ‘the painter of ugly things’ by the press. Despite that, Morning (1884) was included in the Norwegian pavilion at the Exposition Universelle in Paris five years later. Edvard Munch (1863–1944), The Sick Child (1885–86), oil on canvas, 120 × 118.5 cm, Nasjonalgalleriet, Oslo. Wikimedia Commons. 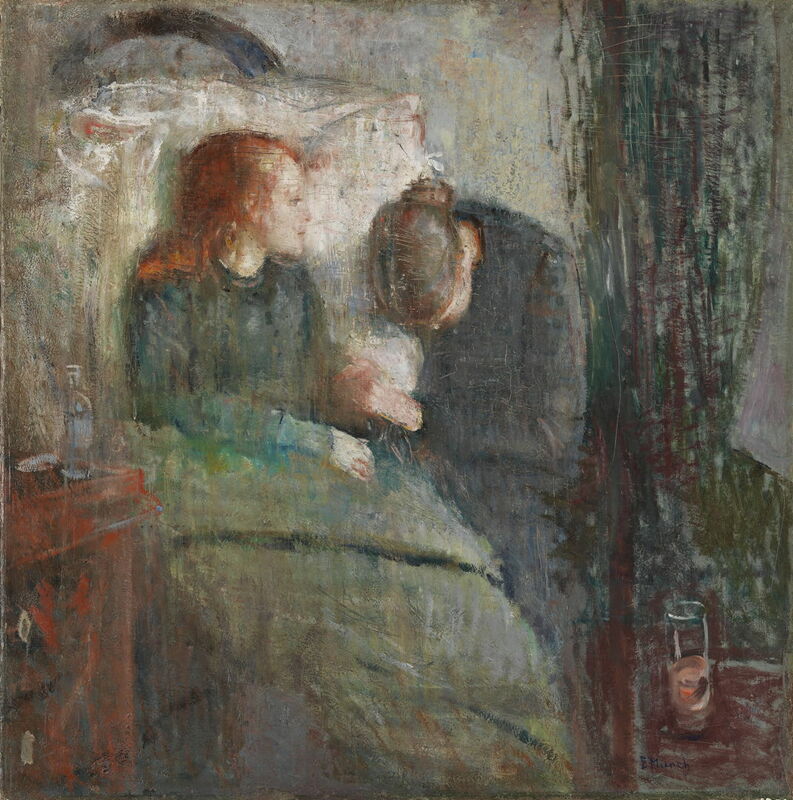 After this naturalist and Impressionist start to his career, Munch started to diverge with the first in a series of paintings of the motif of The Sick Child (1885–86). This marks his open expression of personal experience and emotion in his works, and the appearance of a theme which was to reappear in many of his paintings and prints. He also started repainting the same motif – in this case, according to the artist’s own estimate, no less than twenty times. This first version was originally titled Study, and exhibited in the autumn of 1886, when it was greeted by a critical storm. The art historian Arne Eggum wrote that “no other painting in the history of Norwegian art has provoked such outrage and indignation.” Munch was undeterred, and in the Spring of 1889 organised his own solo exhibition in Oslo, which was received rather better! Edvard Munch (1863–1944), Summer Night, Inger on the beach (Evening) (1889), oil on canvas, 126.4 x 161.7 cm, Bergen kunstmuseum, Bergen, Norway. Wikimedia Commons. In 1889, Munch showed what was then titled Evening, but which is now better known as Inger on the Beach or Summer Night (1889). 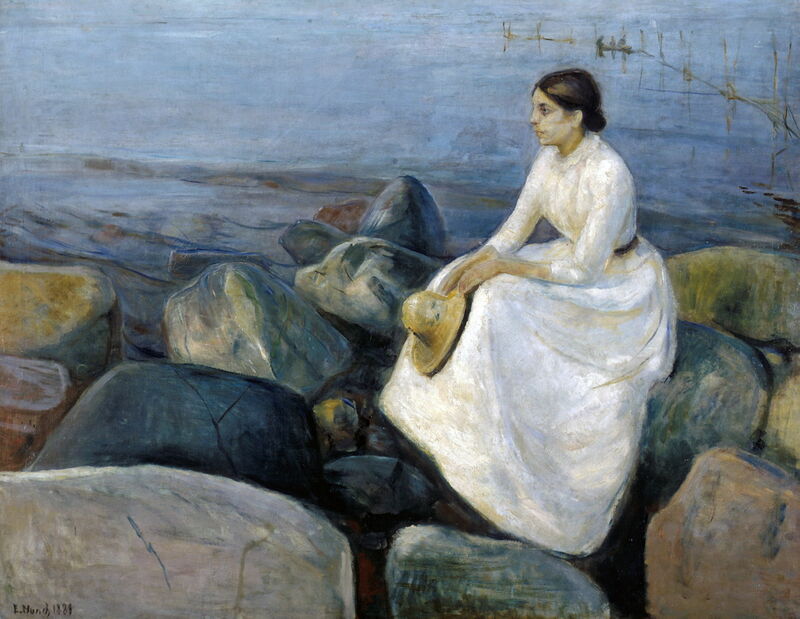 This shows the lonely figure of his younger sister in the melancholic gloom of a boulder beach, and became the first in another series of developments of the theme. Late in that year, Munch travelled to Paris on state travel and study grants, where he studied drawing from life in Bonnat’s studio. Lodging in St-Cloud on the outskirts of the city, he adopted a Neo-Impressionist style for a while. However, at the end of 1889, his father died, and Munch had to assume financial responsibility for his family back in Norway. Edvard Munch (1863–1944), Night in Saint-Cloud (1890), oil on canvas, 64.5 × 54 cm, Nasjonalgalleriet, Oslo. Wikimedia Commons. In Paris, Munch laid down his manifesto, aiming to paint a series of “powerful, sacred” works, which was the foundation of his later Frieze of Life. In preparation for these, he made his dark and melancholic Night in Saint-Cloud during the winter and Spring of 1890. Its only tiny glimpses of light and colour are beyond the window which dominates the upper half of the painting. Silhouetted against that is a man wearing a top-hat, whose figure dissolves into the shadows. Edvard Munch (1863–1944), Rue Lafayette (1891), oil on canvas, 92 × 73 cm, Nasjonalgalleriet, Oslo. Wikimedia Commons. Rue Lafayette (1891) is a complete contrast in its lightness and bright colours, and shows a vigorously Neo-Impressionist use of brushstrokes. Munch returned to Norway in the early summer of 1891, most influenced by the spirit of Gauguin, and over the following year painted some of his most significant works which were to initiate new themes in his repertoire. The first of these was originally exhibited under the title of Evening (1891), but is now better known as Melancholy; as I have been unable to locate an image of this first painting, I defer its discussion until later. 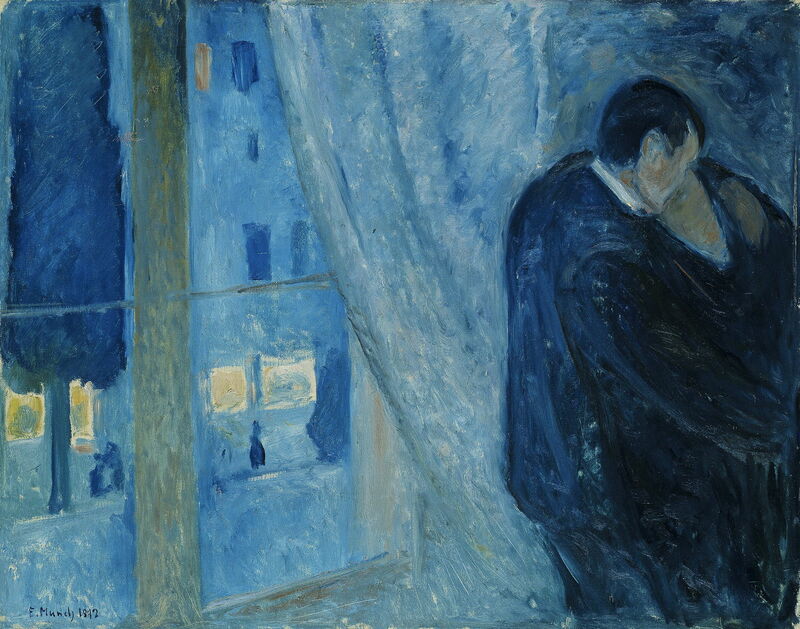 The Kiss or Kiss by the Window (1892) is one of three variants of this theme which Munch painted during the winter of 1891-2, when he was at Nice, on the French Mediterranean coast, which accounts for its soft evening light. Edvard Munch (1863–1944), Inger in Black and Violet (1892), oil on canvas, 172.5 × 122.5 cm, Nasjonalgalleriet, Oslo. Wikimedia Commons. 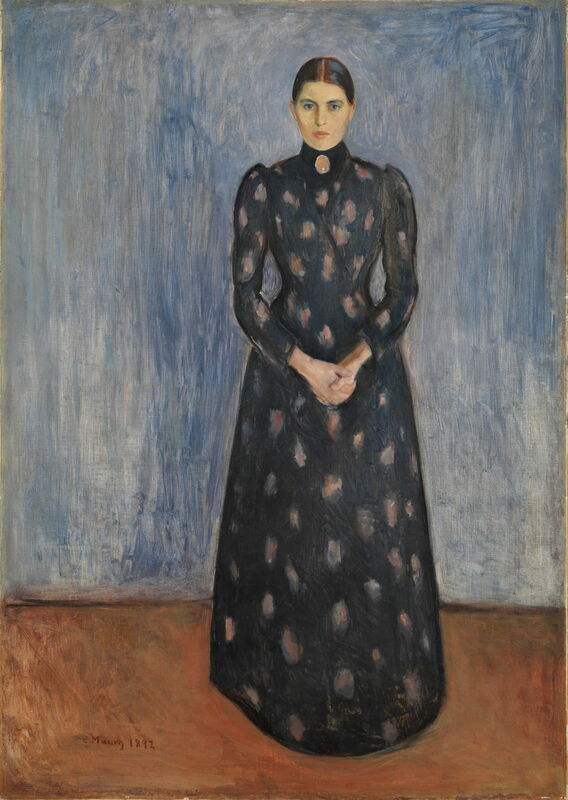 Munch’s younger sister appears again, in Inger in Black and Violet (1892), as a stern perhaps repressive figure enveloped in her solid dress. 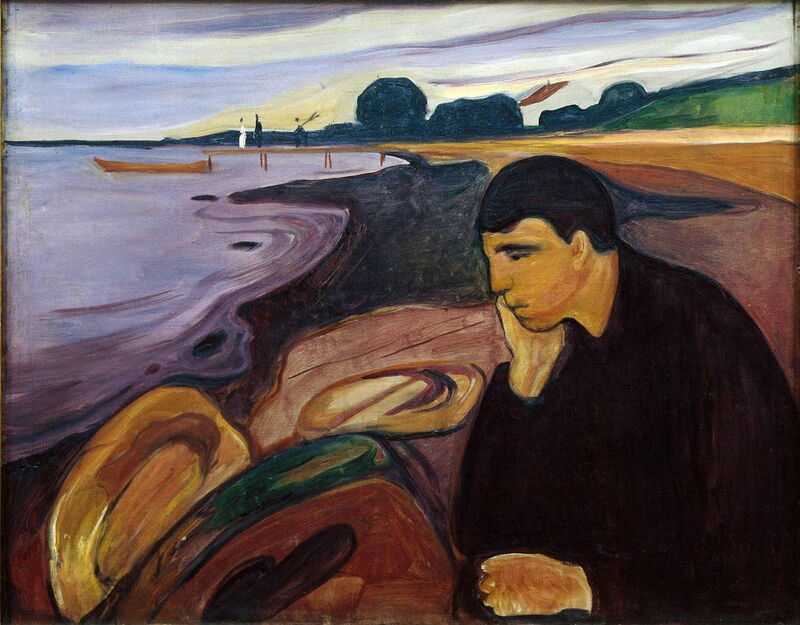 Edvard Munch (1863–1944), Melancholy (1892), oil on canvas, 64 × 96 cm, Nasjonalgalleriet, Oslo. Wikimedia Commons. 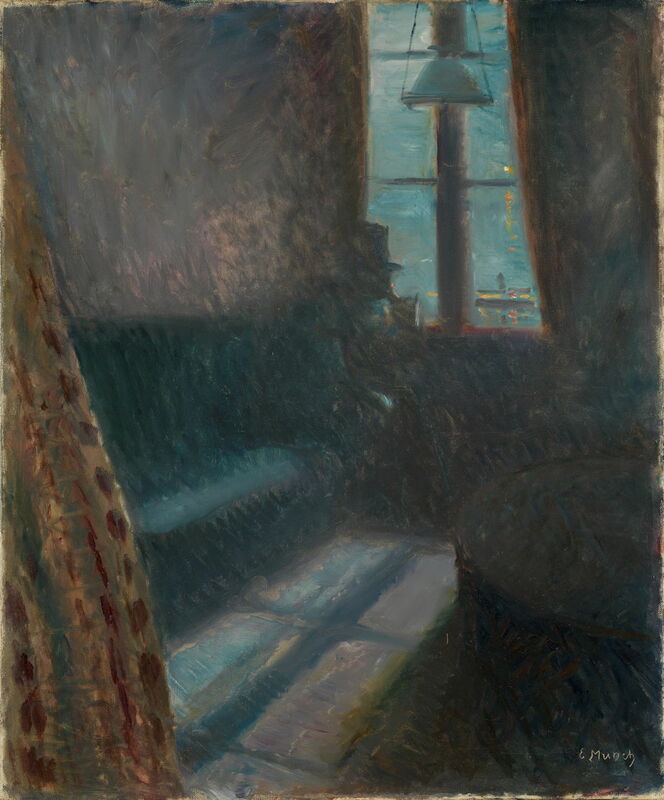 This slightly later painting in Munch’s series of Melancholy from 1892 has most of the same elements as his first composition. The figure is based on a friend, and aspiring author, who had had an intense and ultimately tragic affair with Christian Krohg’s wife. Behind is a boulder-strewn bay, curving undulantly into the horizon, with a bright yellow boat tied to the end of a small jetty. Bands of grey cloud contour across the sky. This version of Melancholy painted in 1894-96 shows developments of this motif. The figure is now sat up, his chin buried in the heel of his hand, morose. The nearby boulders have become more vividly coloured, and less like rocks. In the Spring on 1892, Munch visited Saint-Jean-Cap-Ferrat, on the French Mediterranean coast almost into Italy, where the Norwegian painter Christian Skredsvig and his wife had rented a house. Inspired by a blood-red sunset there, Edvard Munch painted his first version of Despair, the precursor to The Scream. Later that year, Munch was invited to exhibit in Berlin (well before the Secession), where his paintings were considered so shocking that the exhibition closed prematurely. Posted in General, Painting and tagged Bonnat, Gauguin, Gude, Impressionism, Krohg, Munch, Neo-Impressionism, painting. Bookmark the permalink.